Over the last couple of weeks, I’ve written about a recent trip to the Wichita Mountains in southwestern Oklahoma. It’s a unique landscape of ancient mountains, wide valleys and amazing wildlife. If you missed it, you can read my two-part series on our Wichita Mountains trip here and here. This video caught my attention. Anyone who has spent time in the mountains knows that rockfall and loose rock underfoot is scary stuff, particularly when you’re in highly exposed places. If that dude were a cat, he’d be down to eight lives or so. The Elk Range has been described as “red, rugged and rotten.” Now you know why. One fall there, and we’re reading about that fella the next day. Old-school weightlifting can lead to huge strength gains. Make the barbell your friend. I’m a creature of routine. I find things that work for me, then stick with it. This can be a good thing when it comes to training; while some preach constant changes (muscle confusion, brah! ), I’m more of the type who believes you create a program, use it over time and give it time to work. However, there comes a time to change things up. It’s a tough balance between distance running and weight training for me. These forms of exercise compete with each other for time and resources. Want to be fast? You won’t be very muscular. What to be big and muscly? Fine, but forget about being fast over the long-haul. I’ve accepted that reality. I know that I’ll only get so big or so fast, and I’m cool with that. As long as I can tough out a race over 15 miles or more, I’m good. And while I may not ever be a body builder or a power athlete, I like the idea of being strong. A little bit of both goes a long way in terms of staying healthy for a long time, and performing well in the outdoors. Anyway, I digress. I decided it was, in fact, time to shake things up. My leg-day workouts were getting too long, too taxing. And there were areas in my training that got short-changed as a result. 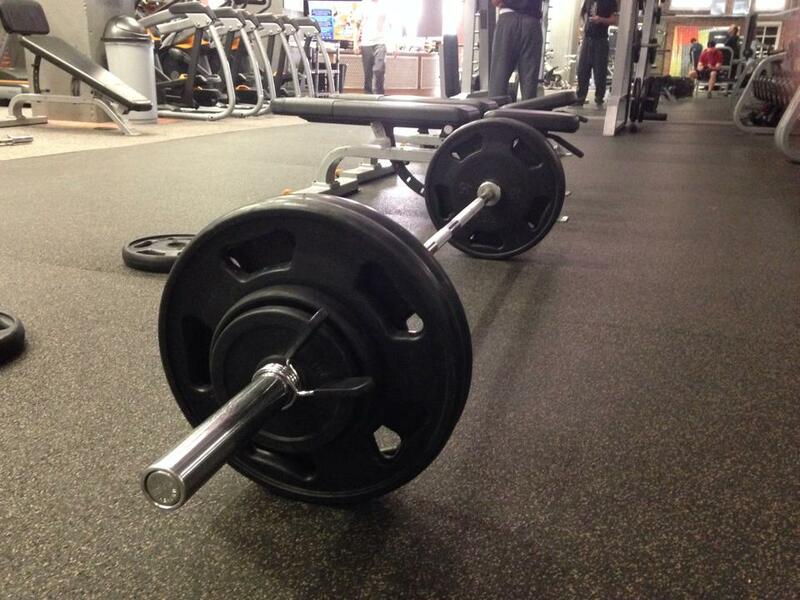 Barbell deadlift: I do four to five sets of these. I start light, but quickly get heavy. This is a power lift, one that requires heavier weights and lower reps. Stand at the bar, feet about shoulder width apart. Hand grips vary; I choose to have one hand palm out, one hand palm in (the axle grip), and both hands gripping the bar outside of my stance. Grip the bar tight, and tense those lats. Pull up on the bar to take up any “slack,” or the little bit of room that exists between the bar and the plates. Keeping your head and neck in a neutral spine position, drive up by firing your quads, squeezing your glutes and driving your hips forward. Your back should be straight, and your chest slightly up (to the point where someone could see the logo on your shirt as you began the lift). When you’re at standing position, your chest should be out (proud) and your shoulders slightly back. Then slowly lower the weight down, bending at the knees and getting your hips back. Tip: DO NOT hunch your back; keep it straight. And don’t tilt your head back to look up at the mirror; doing so will deactivate your hams and glutes and overly recruit your lower back, which you DON’T want to do. If you can’t avoid hunching over and pulling with your back, use less weight and get the form right. I do this in sets of four reps. This ain’t an exercise where you do high-rep sets. Even so, you will get a cardio element during your sets. Tip: This exercise is VERY technique oriented, and it is a riskier move than most other lifts. It’s vital you do weight you can handle, and don’t break form. Farmer’s walk: This one is a lot easier to master. Simply pick up two heavy weights, then walk slowly with them in your hands for a minute. Dumbbells or plates work here. Maintain good posture and keep tension on your shoulders. A real trap-buster, and it will really help your grip strength, too. 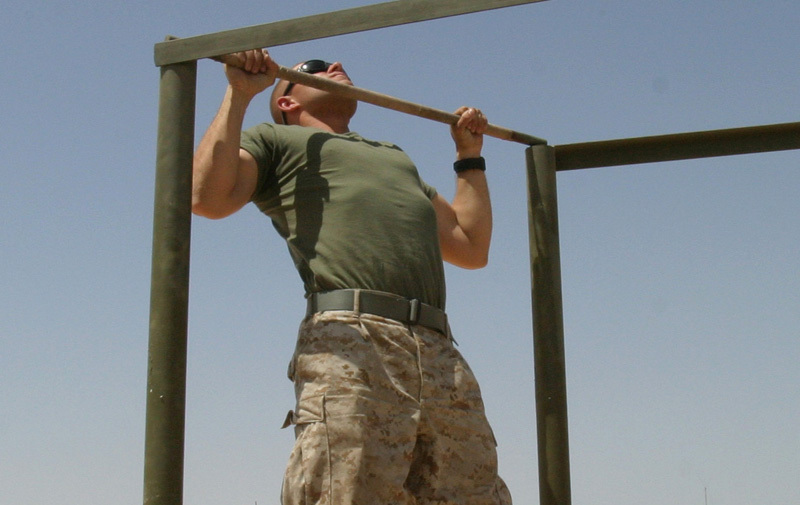 Nothing beats the old-fashioned dead-hang pull-up. Pull-ups: The king of back exercises, especially those broader lat muscles. But don’t be fooled, pull-ups and chin-ups are awesome for the entire back/shoulder muscles groups, as well as for your biceps and grip strength. I strongly recommend doing dead-hang pull-ups (no kipping) for optimal strength gains and muscle growth. Grab the bar, and “pack” your shoulders (don’t start from a completely relaxed position); flex your shoulders so they are supporting your weight at the bottom of the lift). Concentrate on pulling your chest toward the bar until your chin clears it, then lower yourself slowly. With this, do as many reps per set as you can. Rear-delt band pulls: Band pulls? Really? Yes, really. I’ve read some really great stuff from elite lifters who use band pulls to strengthen those small backside shoulder muscles (rear delts, rhomboids), which in turn opens their chest and allows them to get huge gains in exercises like the bench press. Take an elastic band and grab both ends with your hands. Then slowly stretch the band out until your arms are fully extended in full-wingspan mode. Then slowly return to your starting position. Sets of 20 to 25 reps are good on this one. Flexed-arm hangs: A good finishing exercise for the back. Go up to the pull-up bar, then pull yourself up to where your chin clears the bar. Hold that position for, say, 10 seconds. Then slowly lower yourself back down. Repeat. As you get stronger, increase the time. This is causing me to redo some of my other workouts during the week, but I’m good with that. A lot of the things I do are geared toward promoting a stronger posterior chain. This has a couple benefits. First, you can’t be a strong person without a strong back. And second, if you’re an endurance athlete, that entire posterior chain — back, glutes, hams and calves — need to be strong if you’re going to perform well and prevent injuries. Elite distance runners may need to tweak this (for the sake of being fast). But in general, if you’re interested in a high level of general fitness, doing the work on that ole backside should be a priority. It seems that maybe winter is beginning to lose its grip, at least in my part of the world. And that means more time outside. Not that you can’t have a good time in the snow. Anyway, here’s some more goodies in this edition of the Weekly Stoke! It might seem like Alex Honnold gets a lot of attention in this space, but he keeps adding to an already amazing list of climbing and mountaineering accomplishments. His latest was a team effort with Tommy Caldwell to do one of the most radical traverses around, the Fitz Traverse in Patagonia. Not all the news from Patagonia is good. 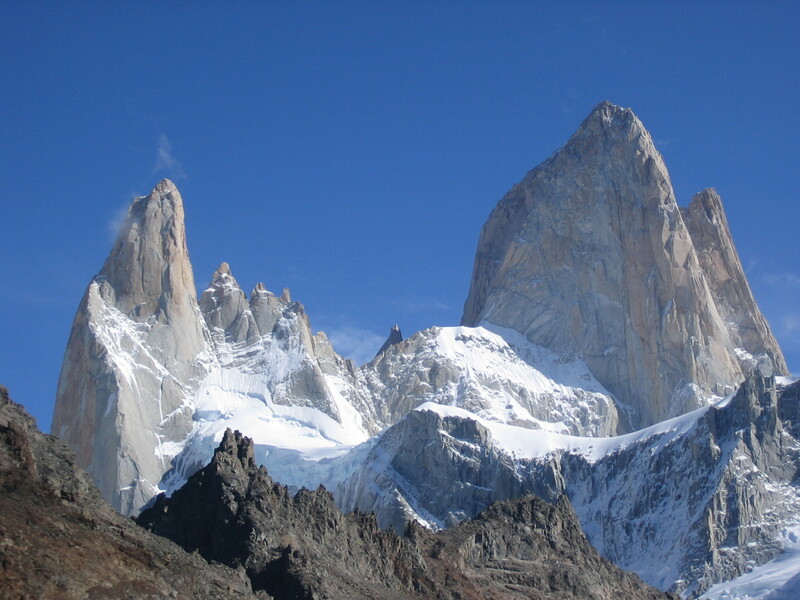 Speed climber Chad Kellogg died from rockfall on Fitz Roy. This post describes some common running mistakes — and how to avoid them. This story is a fascinating account of what it’s like to suffer from a poisonous snakebite while in the bush of Myanmar. And finally, there is this video on avoiding the dangers of an avalanche. Deadlifts are great, but you need good technique to get all you can out of the lift and not get injured. Last week, I wrote about the leg workout I’m doing right now. One of the things I mentioned was deadlifts. That particular exercise is pretty simple: Pick up a weight, put it back down. Repeat. But the reality is that it is heavy on proper technique. I wrote some things to keep in mind as you’re lifting, but sometimes it is better to be shown than just told. So I found this great video that illustrates good deadlift technique. It’s about 5 minutes long and worth every second. Have a look, and then get after it. Some of us are starting to come out of the thaw. Unfortunately, many of you are not. Cabin fever is setting in. You need an escape. So let me give you a little reading material to help you get through it. Let’s do the Weekly Stoke! Scientists say new research shows that the Sherpa people of Nepal have evolved over the years to become the stout high-altitude climbers and hikers that we’ve all come to know and appreciate. Are you getting enough protein? Everyone knows people trying to gain muscle mass need to up their protein intake. But even leaner athletes like runners need to seriously increase how much protein they take in per day. I can vouch for that personally. This link takes you to some photos and a video about a guy’s project to build a wooden camper top on his truck. Seriously cool overland travel stuff here. 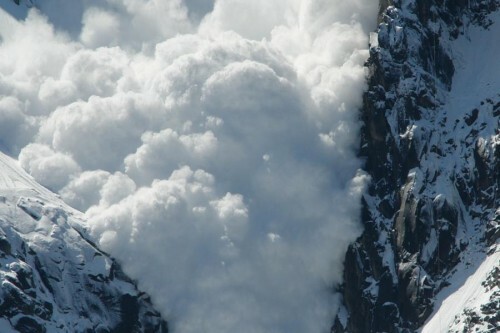 It’s been a rough winter in terms of avalanche deaths, and several have happened in recent days. Another tragic note: A couple did a BASE jump together, but the woman’s chute didn’t open properly, causing her to fall to her death. And finally, this amazing video of Alex Honnold doing what he does: Scaling ridiculously big walls with highly technical lines, and doing it free solo. Another jam-packed Weekly Stoke where we ask why we climb mountains and how to get things done in the cold. Among other awesome things. Here we go! Some Minnesota physicians who happen to be runners give their advice on how to train in the cold outside. This writer answers the question why people choose to climb Colorado’s 14,000-foot peaks. I can relate! Speaking of climbing, Alex Honnold writes about what it takes to go from a good climber to one who has reached the top of the free-solo world. If you’re a Pittsburgh Steelers fan, you know who Alan Faneca is. But now out of football, this former NFL offensive lineman is now a sub-4-hour marathoner. Check out his story here. 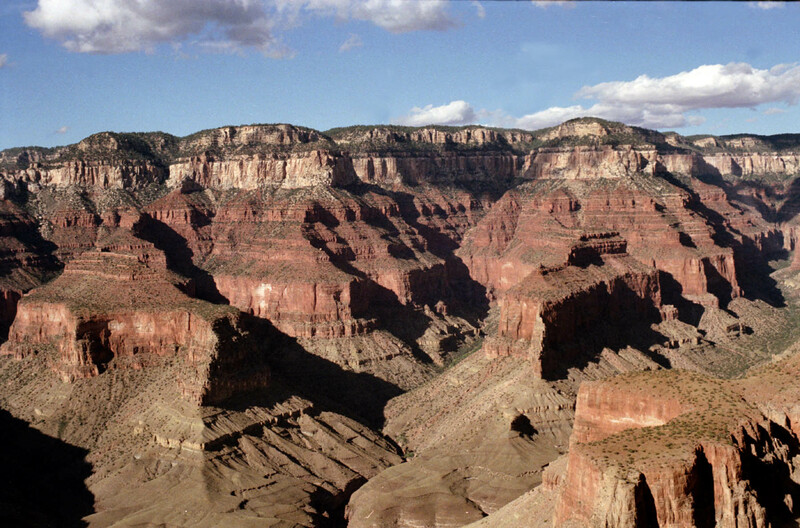 Here’s a guide for trail runners who want to run the Grand Canyon from rim-to-rim-to-rim. This blogger provides some answers as to why marathoners often get sick after a big race. And finally, one of the best videos I’ve seen of Felix Baumgartner’s historic supersonic skydive. The footage came from multiple cameras he had attached to his jumpsuit. Trust me, this is worth the eight minutes.